Sometimes I am a fool. Not reading Jessie Burton’s debut novel The Miniaturist until the start of this year (I said I was behind with reviews) is a prime example, especially when I was sent it the Christmas before last with a note saying ‘Simon, you will really, really love this book’. This has only made me seem even more of a fool when in the last year or so half the world and his wife seem to have bought it and loved it. What there is no fooling about is the fact that I have now read The Miniaturist and what was one of many people’s favourite books last year will be one of my favourite books this year. One day in the autumn of 1686 Petronella, Nella, Oortman knocks on a large door of a strange house in an affluent part of Amsterdam. The door she is knocking on is that of her recent husbands, wealthy merchant Johannes Brandt, yet he is not with her and has not been since the day that they wed and in fact she barely knows him. And so she arrives alone (bar her pet parakeet Peebo) in a strange city and a strange house where once inside the welcome party is more like a party at a wake. The staff; the young and flighty Cornelia and former slave Otto, seem to have been warned off speaking to her, let alone befriending her. Her new sister-in-law, Marin, is ice itself (think of the greeting the new Mrs De Winter gets from Mrs Danvers in Rebecca) and makes it clear that Nella must keep herself to herself and not be a nuisance to her new husband or most importantly Marin, the lady of the house. Things change, though you wouldn’t exactly say for the better, when Johannes buys her the gift of a large dolls house, a replica of their own. It seems that though he has yet to have spoken to her much, or indeed (fans self) visited her bed chamber, he is aware his new wife needs something of comfort and happiness in her life. Soon parcels of furniture and dolls arrive from a mysterious miniaturist, who not only replicates what is in the house they cannot have possibly seen but who also starts to mirror Nella’s present predicament. Things get stranger and stranger when these dolls and furnishings begin to not only predict the future but also reveal secrets that the Brandt household would rather keep hidden and locked away as well as the dangers that lie ahead. ‘Is it – this house?’ Nella says. ‘It’s your house,’ Johannes corrects her, pleased. ‘It’s a lot easier to manage,’ says Cornelia, craning to see into the upper rooms. The accuracy of the cabinet is eerie, as if the real house has been shrunk, it’s body sliced in two and its organs revealed. This is a book of facades. To the passer by the Brandt house would seem like a perfect specimen of the well to do part of Amsterdam, yet within its walls it holds secrets and people inside who all have a facade of their own. What lies behind Johannes aloof business like nature? What lies behind the sharp and hard nature of Marin? Even the new dolls house which should be something of pleasure and fun becomes a more and more ominous presence in the household, an item with its own sense of secrets and forboding. As we read on the more we realise that absolutely nothing is quite what it seems, oh the twists ahead. This theme even continues in Johannes warehouse where it seems he is storing a fortune (not just of his) of sugar – food plays a big part in this book, even defining characters – however it may look white, pure and tempting but mould and rot have started to set in around the edges. As well as being a book about secrets (I am being enigmatic about what these are as wonderfully there are plenty of twists throughout, some early on, which I don’t want to spoil as I didn’t see them coming) and mysteries The Miniaturist is very much a book about repression be itself imposed or forced on others by a single person or society and its rules. This is also where the historical element really comes into play as the social mores, one particular shocking practice I had never heard of, and the repercussions if you break them linger in the streets of Amsterdam around the Brandt house getting closer and closer as the novel goes on. I know it is rather lazy to compare a book to another but I am going to do so anyway because it illustrates why I was such a stonking fan of this book. Lots of The Miniaturist reminded me of Rebecca, which as many of you will know is one of my favourite books of all time, so high praise. Not because it tries to imitate it but because it has some of the key ingredients that I love in any gothic romp of a novel. It has the house that domineers and brims with mystery, it has the innocent woman, the mysterious husband, the gossiping staff and the scary housekeeper/sister in law. It brims with tension, atmosphere and whispers of darker things going on just out of your line of sight. It is basically delicious. Jessie Burton makes this all look effortless and also incredibly entertaining. There are the characters; Nella who is naive and the reader’s eyes as she goes from an innocent girl to the beginning of womanhood, Cordelia is a delight with just the right amounts of empathy and gossip. Once we know more about Johannes we understand and feel for him. And then there is Marin, oh Marin, my favourite character in the book who pretty much steals every scenes and has, without giving any spoilers away, one of the most complex persona’s and stories within the book. Burton’s writing is pitch perfect for the gothic. I found the prose to be wonderfully rich in description. She knows how to give small things away yet keep little things back or drop hints that something dark might be coming, leaving you in suspense of what’s to come. Amsterdam’s streets and society appeared in my head fully formed. Burton also has the power to create genuine tension and hairs on the back of your neck can rise from nowhere in a paragraph. The maid’s name dies in Nella’s throat. Several feet away from the miniaturist’s door, a woman is watching her. No, not watching – staring. She stands still amidst the milling crowd, her eyes fixated on Nella’s face. Nella experiences the unprecedented sensation of being impaled – the woman’s scrutiny is like a beam of cold light dissecting her, filing her with an awareness of her own body. The woman does not smile, her brown eyes nearly orange in the midday light, her uncovered hair like pale gold thread. A chill, a sharp clarity, enters Nella’s bones. She draws her shawl tight, and still the woman keeps staring. From the moment Nella arrived at the Brandt household I was completely smitten with The Miniaturist. It is a big fat gorgeous gothic romp of a story with vivid characters, dark brooding moments and plenty of twists and unexpected turns as you follow Nella through her mixture of wonderment, puzzlement and bafflement in her dolls house, her own house and the streets of Amsterdam. I also utterly broke me at the end, there was much weeping. It’s basically marvellous, if you haven’t read it yet don’t be a fool like me and leave it any longer – read it now! If you would like to know more about The Miniaturist from Jessie herself you can hear her in conversation with me on You Wrote The Book here. 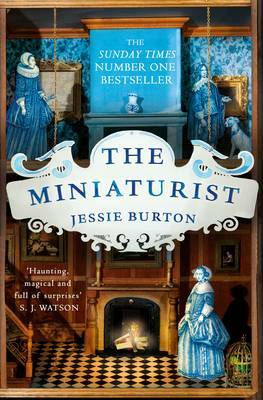 So who else (there are probably loads of you) has read The Miniaturist and what did you make of it?